MVP is a means to test the product that you are going to be launching in the market. It should be understood that MVP does not mean an unfinished product rather it is a way to get feedback for the final product. Let’s break down the term MVP for better understanding. Minimum means a product that has simple features and usually, no users want to use or buy it. Viable is the product that a developer dreams of creating with the help of available resources to fulfill the needs of users. So the term MVP means a way to build such a product that has all the features and at the same time, has used fewer resources. It also should be able to get honest feedback which is how the final product will be developed. The idea minimum viable test does not mean to see if the product can be technically improved or not. MVP shows whether a product should be built in the first place or should not be built at all. Why does your product need MVP? Who would have imagined that apps like Twitter, Instagram and Uber would blow up like this and would gain world popularity? We are guessing very few. In fact, Twitter gained its popularity through gradual growth. So, why do you need an MVP? When an app is developed with many features and attractive designs, it’s development cost is high. An MVP is developed with limited resources and is still a product. The cost of developing an MVP can range between $10,000 to $20,000. However, it can be less than that as well. As a startup attracting new users without spending a heavy amount on ads is quite difficult. MVP for startups is a way to bring in more users by spending less. If users find your product good enough, they will communicate it to their friends and that’s how things go viral. Also, when the final product is launched, getting paid customers from the existing user base become possible. This is one of the main reasons why developers go for MVP. The feedback from the users becomes a way to understand how certain features should be built. In some cases, the idea for the product may not be as benefiting as it looks. This is where MVP saves the developer the time and cost to go all in with the product. Other very important things that go into making an app are time and effort of the developer. Imagine having spent sleepless nights working on an app and when its launched, it gets very less traction. It will be the most disappointing thing for any developer. It’s better to use time and put the effort into building an MVP which will bring feedbacks. If you have saved a couple of million dollars for the projects then you probably may not need MVP to save money. But if you haven’t then MVP is a great way of attracting investors. It is easy to build an MVP that raises money for your app rather than getting no funding for your final product. There are platforms like Kickstarter, Indiegogo, AppBackr, etc that provide funding for apps. What is a good MVP? MVP success criteria is achieved when the MVP is focused on one individual. This means that a buyer persona is used to target the audience and is as specific as defining one single person. As it is said that keeping in my one person and solving his problems with your product gives the best results. The biggest mistake usually made is building for multiple audiences. Even though we are building for one person, we do have to listen to multiple feedbacks. Sometimes different opinions and views solve most of the problems. If people fit into the category of your product, take their feedback seriously. MVP does not mean you have to do less and expect more. Your MVP should be able to showcase what problems your product can solve and how can it solve them. This is even more important if your product already has big competition. MVP test is just as important as building an MVP. It is impossible to earn money from a failed MVP, no matter how much you try. So, make sure testing the MVP is an important part of your development process. An MVP is supposed to find mistakes and gather feedback. Keeping the launch of the MVP limited to as less many people as possible is going to be a wise choice. Validation is not a one-time thing but a continuous process. In every stage, a certain type of validation is required to make sure the product is strong for the market. 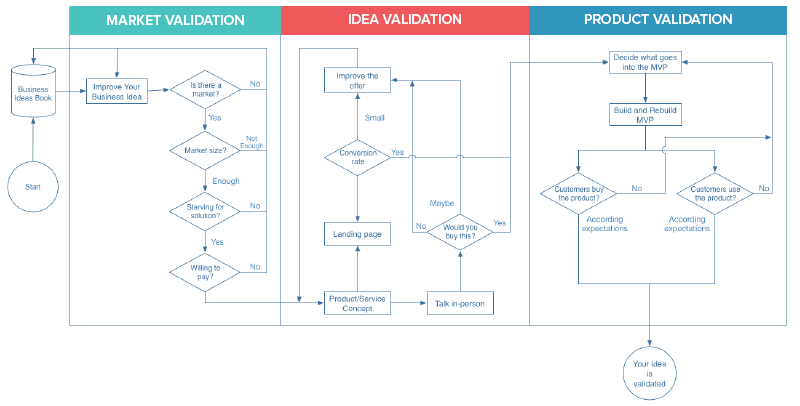 There are some tools which can be used to test the product ideas before building the actual product. When the product is just an idea, try to find out as much as possible about it. Gathering significant information will help in improving the product which will stand out in the market. Tools like Google, Crunchbase, Angel.co, LinkedIn, Google Adwords, SEMrush, Alexa, Quora, etc. are some great sources to gather information. These platforms have vast information on the latest market needs and have a large number of active users. In order to convince others that your product is great, you need to make sure you understand it well. Once you are through with it, use tools and platforms to tell others about your product. Use Quora, Google spreadsheets, Facebook ads, etc to present your product in front of users. You can also use UXPin to bring the product sketches to life or create a landing page with Landingi to create a community. When you see users interact with your product, that’s when you know where the improvements have to be made. Developing a prototype of your product not only ensures success or failure but also creates scope for improvements. Use tools like HotJar, Survicate, SecurionPay, Google Analytics, Woodpecker, Growbots, Appoint.ly, UserEngage, AppSumo, etc. to reach out to a large audience with your prototype and track their behavior. An improper market, product, customer needs, demographic research. What most people forget to do is a thorough validation of the market, idea and the product. Building an MVP is quite easy in reality but building a success MVP is where the big difference lies. Without proper research about the market and the product, the chances of succeeding decreases. Most startups think that building the MVP for all the platforms will increase the success of the actual product. But in reality, this is just going to make the process complicated. If an MVP fails then the developer may not have any money to start over since all the money was spent on developing for different platforms. Bringing in users with one solid feature is a more effective approach rather than launching the MVP with all the features. Even if the other features are good, they can be brought in later in the updates. Prioritize the features to see the best results and reduce the chances of failure. Now, that we know why your product needs an MVP, let’s move onto how to test MVP of your product. Building an MVP is not the only important task but testing its viability is just as important too. A company may think that the product can satisfy the needs of the customers but until and unless the MVP test is run, it can not be said for sure. There are many tactics for testing minimum viable product. But we will discuss only the best ones on this blog. So, let’s begin! Crowdfunding is a way you can test whether your app will do good in the market or not. Platforms like Kickstarter and Indiegogo are a filled with MVPs that get funding from people who find the product interesting enough. This gives your product exposure to a group of interested and active users. The money raised from these platforms will help in building the final product to launch in the market. Having a blog is like having a platform for two-way communication with the prospect users of your product. Blogs are a way to discuss and gather feedback about a product. This will give you an honest opinion about the product by seeing how much keenness the users are showing. Talking face to face with customers provide the most honest reviews. People may lie or sugarcoat the opinions online but when it comes to face to face feedback, it’s as honest as it can get. Interviewing the customers is usually done in a casual manner but is rather descriptive. The interviewee states assumed problems to get feedback on the same. It is quite obvious that if an image can speak a thousand words then a video can speak millions. Explainer videos can be used by developers to demonstrate the functionality of the product and answer questions like what, how and why. At the end of the video, the viewer must be clear about what the product is, how it works and why does he need it. Dropbox is an example in such a case. They used a video to gather subscriptions for a product that didn’t even exist. Pre-orders are quite popular with books, gadgets and other interesting products. When it comes to pre-ordering, the idea is to convince the users with your product enough to make them pay for it beforehand. However, there is a chance that users may not be willing to put their money at risk way before the product is even born. For this, the presentation of the product must look as appealing as possible. Social-media surveys are quick, easy and most of the time gives honest feedback. Of course, this works when the focus is on the right questions. For instance, Facebook surveys have a feature that allows users to add their own options as an answer which gives interesting insights. Another good reason to use social-media surveys is that users don’t need to go out of their way to fill in the surveys. Unlike digital prototypes, these are tangible. A paper prototype is build to understand a product’s user experience. Anyone in the team can use these prototypes can understand how the product works. This will be very useful in the case of physical products like mobile phones, tables, chairs, etc. Sending emails to see how many users click on the links or follow up with the email is another way of testing MVP. However, this works even better when you already have a list of emails. While the emails have been sent to the users, make sure to track the actions with the help of tools such as Yesware or use the built-in plugins. Landing pages are the pages the prospective customers go to find out about your business. A landing page can show the interest of the customers with the way they behave and interact on the page. Building a landing page should always be followed by tracking analytics with the help of tools like Google Analytics, KISSmetrics, etc. There is a high chance that the product you are thinking about launching is already present in the market. This can make your new product suffer. To avoid that try analyzing the competitor’s product and see what they have that your product doesn’t. Also, your product’s unique feature can become the strongest feature. A/B testing is a way to test whether one version of a page is more effective than the other. This test can be done on a webpage where two different versions of the same page are shown randomly to the visitors. Then with the help of tools like Google Analytics, Unbounce, etc. information can be gathered about the interaction. Piecemeal MVPs means building a demo of your product using existing tools. For instance, Groupon is the best example of a piecemeal MVP. what Groupon did was built a WordPress website with Apple mail and a script that generated PDFs for the orders. This way the effort and cost of building an MVP become much less than anticipated. You will be using PPC campaigns at least once for your actual product so testing out your MVP will be great. For starters, you can pitch in $100 and see the results. If your MVP does not get any leads, then either your ad is flawed or your idea is not good enough. The disadvantage of general surveys is that they are too long and at times becomes quite annoying for online users. Users either skip the survey or fill it in a hurry and that is why these fail to give the accurate results. In micro-surveys, you can ask a couple of MVP survey questions to which you will get honest answers. Micro-surveys have two to three questions which online users find easy to answer. Platforms like Google and Facebook are the go-to when it comes to running ad campaigns. Before the product is even launched, you can put up ads and see how many users engage with it. There are even tools to analyze the clicks, engagement and other important behaviors. Using SaaS and PaaS to build an MVP can help you in testing your MVP quite well. There are multiple choices to choose from and the building becomes easier and faster. 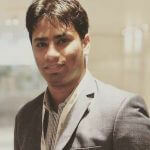 These software and platforms also help in increasing reach of the product. 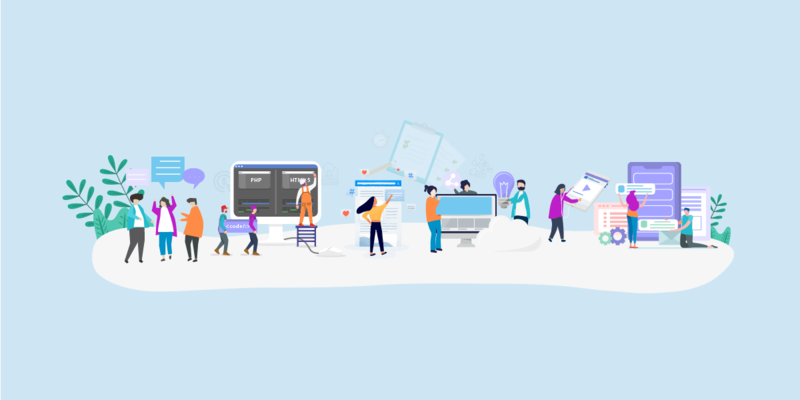 Usually, developers face problems like compatibility of the app, mobile-friendly design and other code-based issues which can be eliminated as these tools already have taken care of those issues. A manual-first MVP (Wizard of Oz) is a way of interacting with actual customers rather than running an online survey. This MVP testing technique shows a picture of a fully completed product and when a user orders it, you deliver it manually. In this MVP testing, the users are getting what they see. Even though it takes much effort but it is worth it. 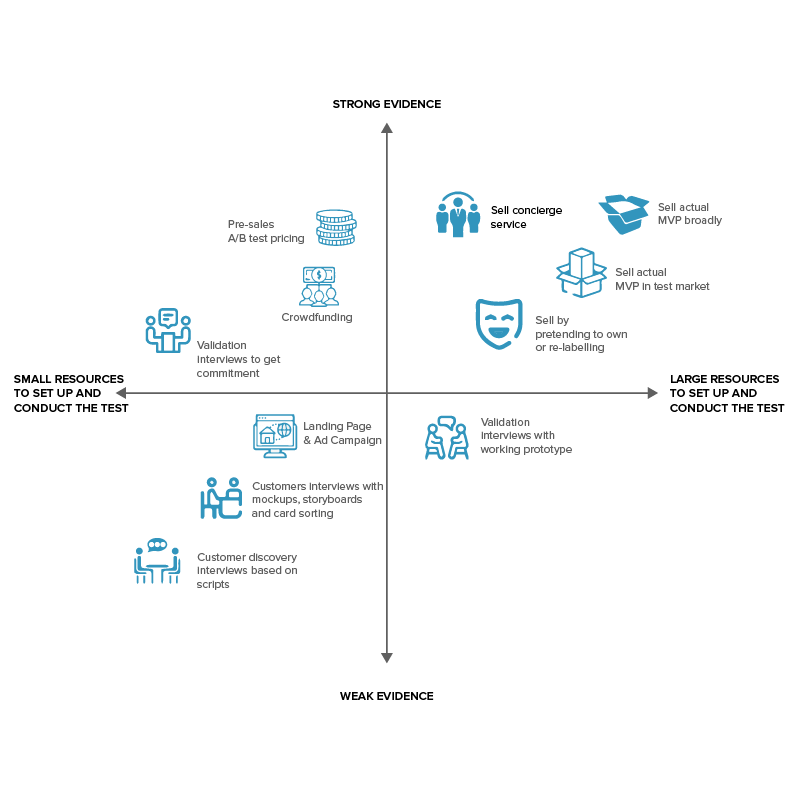 The concierge MVP test is similar to the manual-first MVP test but instead of faking the products, the products are real. This MVP tests and answers whether the users are willing to use and pay for your products or not. An online dress rental business, Rent the Runway, tested their business model with this MVP testing technique. They were able to find the right answer to their questions. Digital prototypes can be used to display the actual product in a digital way. Wireframes can showcase products such as apps, games, etc. These prototypes can be anything from screenshots to digital sketches to mockup apps which will validate the user experience. Sometimes testing the one and an only strong feature of your product results in the best conversion. Getting feedback on that one feature can help the product immensely rather than focusing on multiple features all at once. It will also help in narrowing down the customer base and will allow better focus. This testing is considered one of the most advised MVP testing strategies. If nothing works then there are multiple softwares for MVP test. Software such as QuickMVP, OpenHallway, Five-second test, Justinmind, InVision, etc. are some great ones to get your MVP tested. 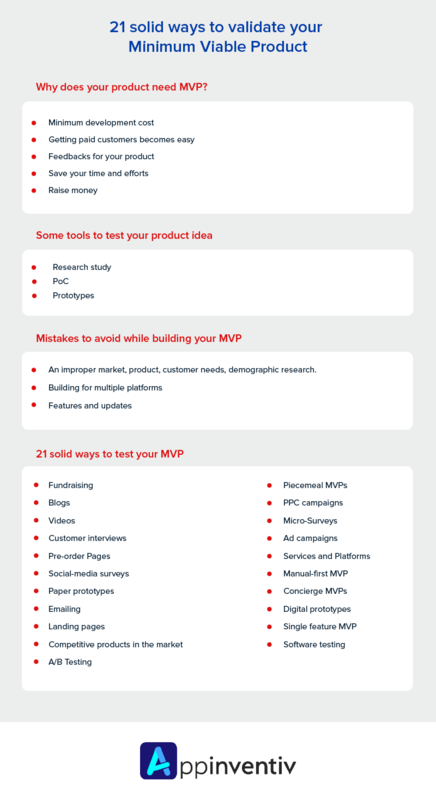 These are the 21 ways how to test MVP to get the most out of it. If you have any further inquiries, contact us at Appinventiv and we will help you get started.